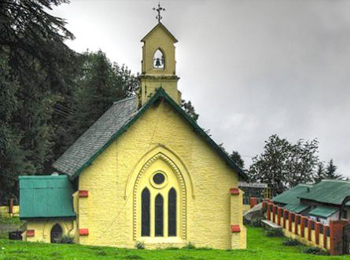 Built in dressed-stone structure with lance windows, the Chamba Church steals the attention of millions of tourists. Situated in the main Chamba market, this church was made by Raja Sham Singh and honored to the Church of Scotland mission for the use of the community of Christian in Chamba. The foundation stone of this church was laid on 17th February, 1899 A.D. and the work was completed in 1905 A.D. It was built in the presence of the Scottish monk Dr. M'Clymont, who had come from Scotland. Overview It's a small edifice of earth colored stone and arched windows, which complete the architectural style of Chamba Church. The Raja had lent a generous grant to make the church and assured that it was built in fine stone brickwork. An undecorated displayed brick walls distinguish sharply against the turmoil of its encircled edifice. The walls are backed by buttresses and the lancer arch windows offer ventilation and light. Travellers can easily reach Chamba Church which is located next to the popular Laxmi Narayan Temple.